The Drew Parade II is the industry's most copied therapeutic shoe, often duplicated for its great casual style and host of comfort benefits. Two removable insoles allow for the best possible fit and full customization with the greatest of ease. 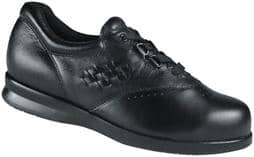 Firm heel counters, wide steel shanks and polyurethane rocker bottoms make the Drew Parade II an orthopedic shoe any podiatrist would be happy to recommend.